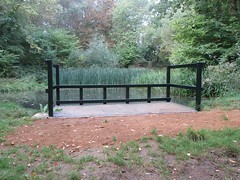 A NEW pond dipping platform has been installed at Lousehill Copse, Tilehurst. The platform has been specially fabricated in steel and installed by local contractors to replace the timber platform which was destroyed by vandals. Work on the dipping platform started on Wednesday 12th September and is now complete. Lousehill Copse is a small, natural woodland surrounded by housing, tucked away along Tay Road in west Reading, with mature oak and hazel woods. It is a designated Wild Life Heritage Site and in 1992 became part of West Reading Woodlands Local Nature Reserve. The Council’s parks team has recently been working closely with The Conservation Volunteers (TCV) to carry out a number of improvements within Lousehill Copse. TCV has already created a clearing to open up views from the bridge to the pond, reduced the amount of reeds and cleared the pond of rubbish. Cllr Sarah Hacker, Reading’s Lead Member for Culture, Heritage and Recreation, said: “I’ve visited Lousehill Copse and I was taken by just how wonderfully rich in wildlife it is! It really is a hidden gem. “Pond dipping platforms encourage visitors to learn and have fun with the wonders of the aquatic environment. These improvements are part of our commitment to education, encouraging biodiversity and conservation and we hope that this new platform will help the adults and children who use it develop a lifelong love of nature and the environment. Buffy Harris-Jones, The Conservation Volunteer’s Senior Project Officer, said: “As part of this two year project we are making the woodland more accessible to local communities by improving the infrastructure, for example, installing steps in very steep areas and installation boardwalks over very wet areas. We want everyone to visit Lousehill Copse and are sure they will fall in love with the woodland as we did! The improvement work is part of an ongoing programme which began in 2013, funded with contributions from development via Section 106 agreements. The copse has benefited from £35,857 funding, of which £17,400 has been invested to date towards the maintenance of and management of the copse, as well as the provision of public access improvements.